Swipe Auctions Scam – How Swipe Auctions Actually Works – The Secret is OUT! You might be here because you are wondering if SwipeAuctions.com (Swipe Auctions) is a scam. Well you’ve come to the right place. I am going to divulge a lot of information about the inner workings of Swipe Auctions through out this entire article. Buyer Beware. Armed with this knowledge you will be able to make an informed decision regarding Swipe Auctions as well as any other Penny Auction website. At the end of this article, you can find many comments from other readers who have had direct experience with Swipe Auctions that I hope you will find useful. Feel free to add your own opinion and knowledge of Swipe Auctions if you have any. Swipe Auctions is a penny auction website that promises savings of up to 90% and unbelievable deals on EVERYTHING! And their registration page and home page makes everything look great… You might even say, too good to be true? You might even considering googling “Swipe Auctions Scam” or “Swipe Auctions Reviews” to see what other people have to say about such fishy (perhaps fraudulent) claims. Also be careful, this same company operates several websites with different names, and there are many other “clone” websites out there that are all the same. 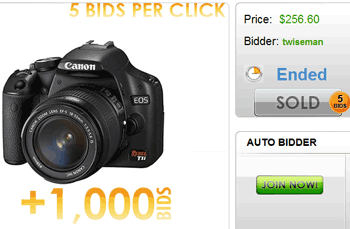 Keep in mind, Swipe Auctions also operates the exact same site under the name Swipe Bids. YOU HAVE TO PAY EACH TIME YOU PLACE A BID!!!! And each time you bid, the auction’s timer increases just a little bit, by about 12 seconds. 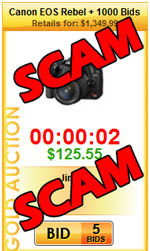 So you’ve gotten your camera bid in, you’re about to win a $1000 camera for $124 and there’s 3 seconds left on the clock, right? Wrong, someone else just bid extending the action another 12 seconds and increasing the price by another PENNY …. and this can go on for HOURS. Gee, how much do these bids cost? Well this is the thing overlooked by most people when they sign up for Swipe Auctions penny auction website. They instantly charge you $150 to your credit card to buy 300 bids. This is only shown on the second registration page, after you have already typed in a bunch of personal information… And they make this a little sketchy because the second page looks almost identical except for where they slip in this wording telling you about the $150 charges to your credit card, Its not like a shopping cart with a checkout. A LOT of people don’t notice this part, nor do they notice where it says “no refunds”. You see, that’s how they make money selling things so cheap, the bids cost money therefore subsidizing the cost of the actual item, and with each bid, its like a SWIPE of your credit card… Get It LOL. Any one auction may have hundreds or even thousands of bids by the time the auction is finally won, and those bids are what pay for the auctions item and put money into Swipe Auctions fraudulent pockets (OK, so this isn’t technically fraud yet but read on). Take this example… What if an auction is ending too early without enough bids? Swipe Auctions can step in and bid themselves to up the anti and force you to spend more bids and extend the auction a little longer… And who is going to be able to stop them or monitor this process? Swipe Auctions wont even give away their location if you ask! Sure there are some winners, some people do in fact win very cheap items… however for every one winner, there are SEVERAL losers. Everyone has to pay for their bids, regardless of whether they win the item or not. And in order for Swipe Auctions to actually turn a profit, the odds need to be stacked highly against you – the bidder; so that you will actually, in the end, not save any money at all… If everyone actually saved money, If EVERYONE actually won things for 90% off, the website would be bankrupt. This is the same way casino’s work, the odds are stacked against the gambler. OK OK, casinos are not a scam, people know how casinos work and the house NEEDS to win a majority of the time, however Swipe Auctions has the ability to hide behind the internet and can pull all sorts of nasty tricks on you if they want to. You see, all auctions on Swipe Auctions are started by Swipe Auctions themselves. They control everything, and if they plug an auction into a mathematical formula and see that their product’s auction is about to end without turning a profit, their software can easily place it’s own bids to extend the duration and force people to buy more bids for the item. HOW ELSE would they be able to operate with such a low volume of customers? I mean this website is NEW and its not well enough known to have an enormous volume of bidders across their pages of listed items, I mean its got nowhere close to the traffic of Ebay, comparing Swipe Auctions to Ebay would be like comparing a SkyScraper to a grain of sand in traffic size…. On top of this, they are unlikely to get a lot of return visitors because each auction needs to have several losers, each of whom can waste in excess of $100 in bids on just one auction. At using an EXTREMELY conservative estimate of 5 cents a bid (you can bid on bid packs to win more bids, the cheapest you will ever see is around 5 cents per bid, usually closer to 10 cents per bid), people still spent $1,283 on bids alone (probably closer to $2,500 in reality), and the guy who won had to buy the camera for $256 on top of whatever he spent on bidding. So do you still want to try Swipe Auctions? What are your thoughts?